South East London Mapping Party. tomorrow and Sunday. i won't be able to go due on the Saturday due to work. unsure about sunday. they is friendly bunch. if you are around and interested then pop along either day. tell them i sent you. new years eve. still in leicester. seem to have forgotten to do any socialising. i'd set myself a target of doing the entirety of leicester east of the railway line. this was not to be, but i'm still quite pleased with what i did : northfields, humberstone, hamilton, netherhall, thurnby lodge, rowlatts hill, north evington, random bits around the city centre, and a good start on crown hills/spinney hills. i hope by year end 2008 it will be finished. i return to london tomorrow. i shall be in the pembury tavern in the evening. So today I went to Leicester and then I bought a bicycle. Had a little go on it (the light was going), and it's true, you don't forget. I spoke a bit to the guy who runs the bike shop (it's the little one in the corner of the Town Hall) and he seemed interested in the mapping. The cycle maps they did have done partly by the city council, from 1998, have now all run out and the council are not interested in reprinting, despite demand from customers! Gave him the link to the cycle layer. They could certainly sell printed OSM cycle maps of Leicester. Hopefully not too distant I will have got all the data acquisiton done and then we can see about doing that sort of thing. hmm, maybe today isn't such a good day to go and quietly map the Kensington/Westminster border. playing around with osmarender, i made a sort of tube map. Saturday 8th and Sunday 9th September. You don't need to have a GPS (they are available for loan) or really any idea what you are doing (it will be explained and newbies can possibly be paired with people who've done it before) beforehand. Plan is to hit the Shoreditch/Wapping area on Saturday, and expand outwards to the vast uncharted wastes of Hackney and Tower Hamlets on the Sunday, depending on how that goes. today i walked 18km in Kew Gardens. one of today's letting agents wanted an upfront fee to register with them before. who should i report them to? this has got to be illegal. but news is not entirely bad, as seeing flats tomorrow and tuesday in clapton and manor house respectively. leicester looks nicer now. presence of river, parks and entire outer and inner ringroads good †. absence of hinckley road and narborough road bad. it's remarkable how much you can do with low-res satellite photos and the out-of-copyright NPE maps. † not that leicester has an entire outer ringroad, of course. this weekend i have been mostly mapping SW1 (St James's, Belgravia). going to have to make a return trip to Belgravia to get all the mewses and a few other roads i missed. I discovered that Eaton Square isn't! pembury this evening for cider&games: beer festival rush had largely finished so we were able to play games without much problem. work is going well. to bed now..., for an early start tomorrow. today's map update. missing: brunel walk, brunel road, victoria crescent, kerswell close, notes as to the one way system, random twiddly bits on russell road and braemar road. i've not added edgecot grove, which google maps thinks is a through road, as it doesn't seem to exist in any meaningful way (being a very shallow cul-de-sac at one end). that could really catch people out. GPS device arrived! i spent this afternoon wandering around seven sisters and various other parts of london making GPS trails for openstreetmap (which is like Wikipedia, except for street maps). 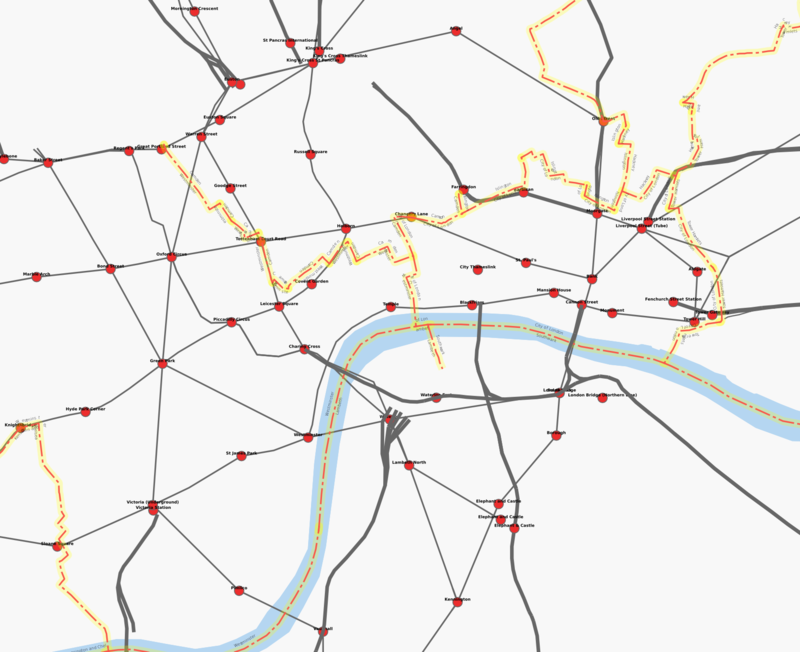 added a few roads today, will try for a great big wodge of the seven sisters road/west green road triangle tomorrow.